When exosomes were first discovered more than 30 years ago, most scientists thought they were useless bags of waste released by our cells. But in recent years, researchers have realized that exosomes may be able to help us understand, diagnose and treat a variety of diseases. A new study led by Drs. David Allan and Yevgeniya Le shows the potential of exosome research for acute myeloid leukemia (AML), a kind of cancer that starts in the bone marrow. They identified small RNA signals in exosomes released by certain “normal” supporting cells in the bone marrow that could actually help leukemia cells grow. Using samples from patients at The Ottawa Hospital as well as publicly available gene expression databases, they explored how five of these RNA factors could play a role in leukemia. If confirmed in other studies, these factors could be used as targets to develop new therapies. See Stem Cell Reviews and Reports for details. Authors: Barrera-Ramirez J, Lavoie JR, Maganti HB, Stanford WL, Ito C, Sabloff M, Brand M, Rosu-Myles M, Le Y, Allan DS. 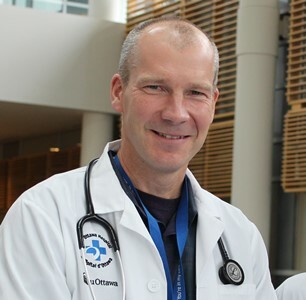 Funders: This study received no dedicated funding, but researchers at The Ottawa Hospital are supported by generous donations to the hospital.